Just a day after Google was strongly rumoured to have accelerated its plans to launch a Siri-competitor, another mobile rival has jumped into the voice assistant space with its own product, after LG unveiled a personal assistant service. Available only in its native South Korea for now, ‘Quick Voice’ (which doesn’t even have an English name as yet) is coming initially to the company’s Optimus family of phones. The voice-activated service will allow device owner to search, navigate and run other functions, such as managing calendar appointments. 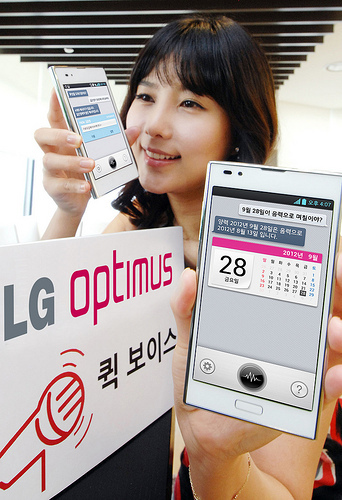 The service sees LG steal a march on Apple in Korea. Siri does not yet support Korea, although that will change when iOS 6 is released publicly. For now though, an unofficial effort built by a local student — which understands Korean but speaks English — is the nearest thing to a native Korean Siri for Apple fans. Fellow Korean mobile giant Samsung has also joined in with its S Voice service — developed in partnership with Vlingo — which is available on the Samsung Galaxy S III, and possible more of its Android-based devices. It remains to be seen if LG will release the new service outside of Korea, and it would certainly take considerable work since Apple itself has had issues localising Siri to support languages other than English. Given that LG is not among the top five handset makers worldwide, we’d be surprised if the firm goes to the trouble of supporting English and other languages for the very slight gain it might provide. Korea’s smartphone market is an increasing buoyant space and smartphone ownership recently passed 50 percent of all mobile phone users, despite a relatively late start as Koreans initially preferred Web-enabled smartphones.